No confidence in Theresa May reaching agreement with EU leaders, says Scottish minister. Intensive work is under way to prepare Scotland for a no-deal Brexit scenario, constitutional relations secretary Mike Russell has announced. In a speech to Holyrood, the Argyll and Bute MSP said that the momentum of negotiations appeared to indicate that the UK was heading out of the EU without a deal in place. It follows comments by Nicola Sturgeon that a no-deal Brexit may be the "most likely outcome". Prime Minister Theresa May claimed this week that a Brexit deal is 95% agreed, although described the Irish Border issue as being a "considerable sticking point" and said that she is prepared to "explore every possible option" to break the deadlock in talks. 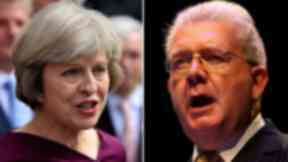 However, Mr Russell said that UK Government ministers are incapable of reaching an agreement. He urged the UK Government to revise its negotiating position and ensure that the whole of the UK remains within the single market and the customs union. He said: "The fact that they are talking of hiring boats, packing motorways with lorries and stockpiling medicines illustrates the vacuum in leadership in the UK, which is resulting in measures unprecedented in peacetime. That cannot be willed away by any of us. "A decision to maintain membership of the European Single Market and Customs Union would both secure a withdrawal agreement and provide the clarity needed on the future relationship. "If the UK Government put this option on the table then we will commit ourselves to support it. "But without such a proposal we will reject every other option short of staying in the EU as all deliver not progress but a succession of unacceptable and damaging bad deals, or ultimately no deal at all." Scottish Conservative MSP Murdo Fraser said the minister's statement was "another opportunity for yet more grandstanding and grievance from a minister who's become a minister in both." Scottish voters backed remain by 62% in the referendum.